ART LYON: design, editing, writing, illustration, digital coloring, and other arcane secrets. 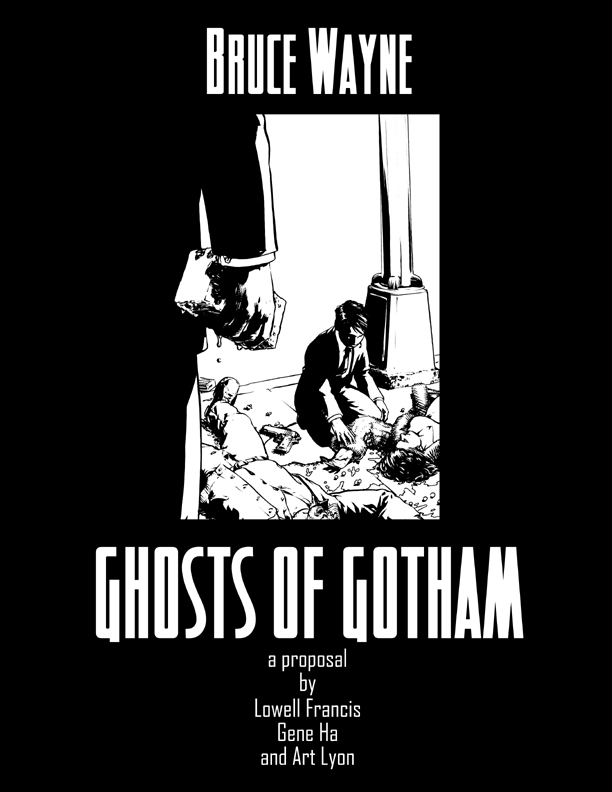 Of all the ideas the three of us pursued in depth, Bruce Wayne: Ghosts of Gotham was by far my favorite. It would have been part of DC’s “Elseworlds” imprint, an alternate take on existing DC Comics characters, their connections, situations, histories, motivations, modi operandi, etc. I kind of fell in love it, I think because of the fun and challenge of working out all those differences and new connection, because it was our own little version of the DC universe, and because of the chance to make more interesting a some characters who I normally don’t have much affinity for. Initially it was a broad, sweeping thing that included characters from across the DC universe, including Superman, Lex Luthor, the Legion of Doom, and many more. There was a whole alternate Teen Titans idea in there somewhere. Because of the scale it started feeling a bit like Mark Waid and Alex Ross’ DC mini-series Kingdom Come. Eventually we wisely narrowed the focus to Batman’s usual stomping grounds, Gotham City, perhaps with the thought that we could explore the larger-scale ideas and implications in theoretical sequels. Once we made that decision, the story really started to gel. Lowell still loves our treatment of Edward Nigma (traditionally the real name of the classic Batman villain, The Riddler). 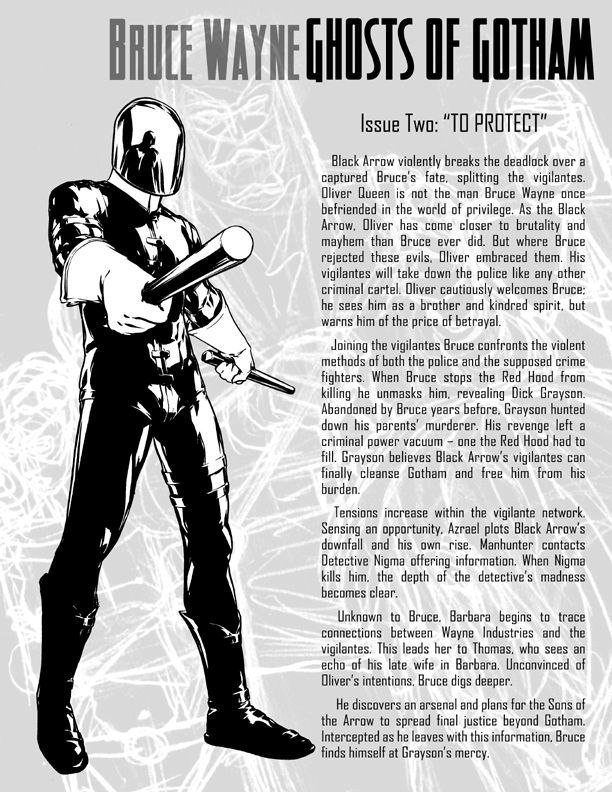 Once we started calling Green Arrow “Black Arrow”, I immediately thought of Robert Louis Stevenson’s The Black Arrow: A Tale of the Two Roses (a personal favorite of mine), and wanted to have his background and story arc mirror some of things in that novel. 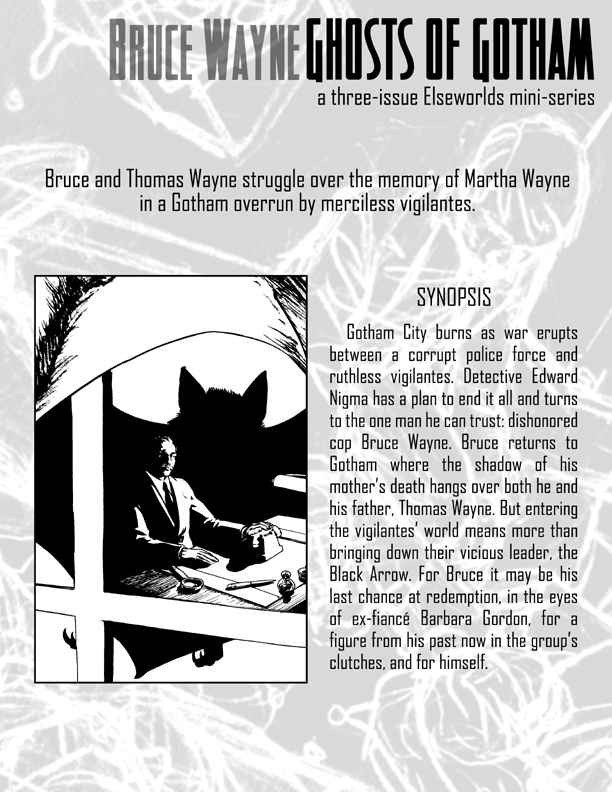 Instead of the classic moment in Batman’s “origin story” when a random thug with a gun senselessly murders Bruce’s parents before his eyes – setting Bruce on a disciplined path of revenge, justice, and a war on crime – in “Ghosts of Gotham” Bruce’s mother alone was shot and killed, and his father proceeds to beat the thug to death with a brick – as Bruce watches on in horror. But I should let the pitch speak for itself. These are the actual full pages of the proposal we presented, so you’re seeing what the folks at DC saw. Text by Lowell, art by Gene, layout by me. I have no idea how I would have colored this comic at the time, had it come to that. Looking at it now, I would approach it very, very simply, since Gene was using a lot of blacks. 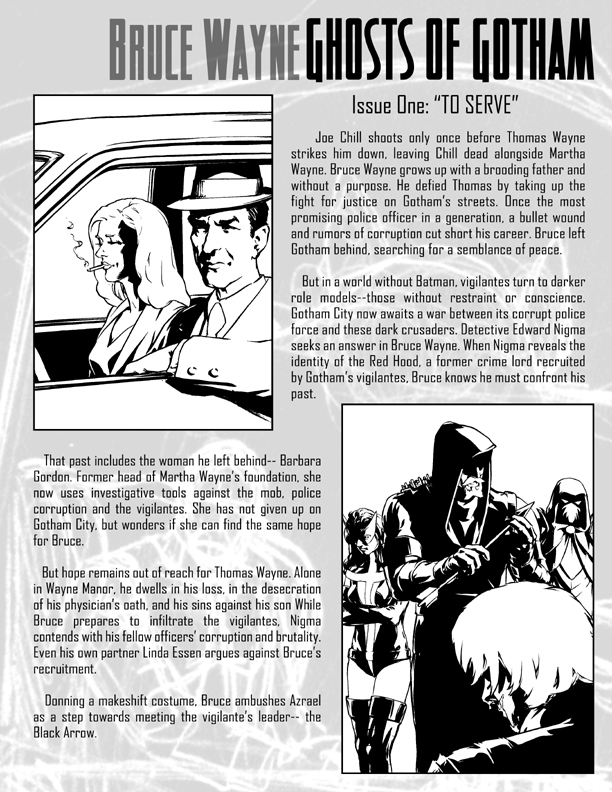 The background images behind the text are taken from Gene’s rough sketches. Click on the thumbnails below for bigger, readable versions. 1. 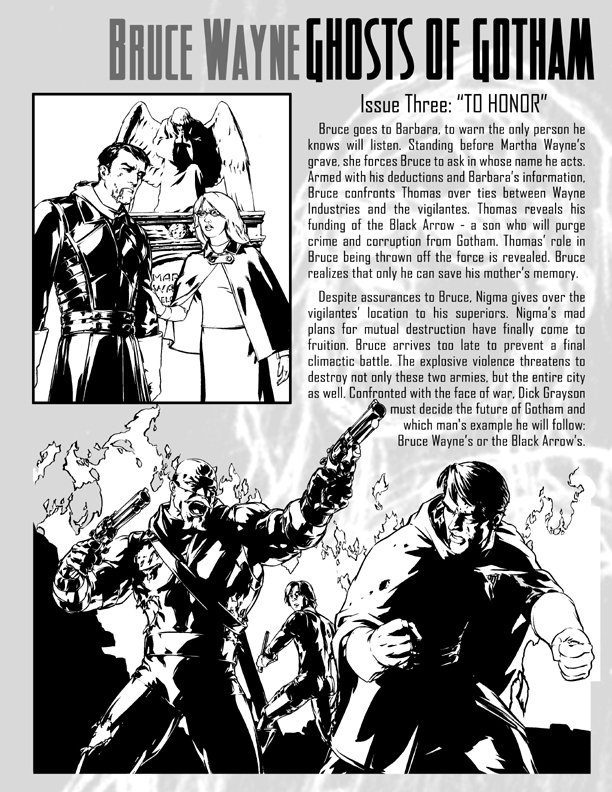 Apparently, in an Elseworlds story about Bruce Wayne, by the end of the story someone has to put on a Bat-costume of some kind. It’s a rule or something. I think we just didn’t want to force the whole bat-thing, and kind of wanted to explore a Gotham that didn’t have that. Oddly enough, our original, larger-scale idea would have not been so focused on Bruce Wayne and would have gotten around that. 2. By the time we presented the idea, DC was kind of done doing Elseworlds stories, but hadn’t made a point of it publicly. They were trying to refocus their brand, which eventually led to The New 52 version of the DC universe. So, there you have it. I still have the crazy dream of using this idea – or something stemming from the same altered turning-point – as the setting for a role-playing game with friends some day. ART! is an unknown variable.